Note: This article describes how to track conversions with Google Analytics. Advanced and Premium customers can also use the dashboard's Conversion Tracking feature. Knowing how well your website is converting is critical for businesses selling goods and services online. For example, at Zendesk, we’ve found that visitors who have a chat are three times more likely to sign up for a trial. Zendesk Chat already offers an Analytics feature that gives you an efficient way of tracking your chat and agent activity. With Chat Analytics, you can track your chat volume to get a better idea of which days are the busiest, examine why chats are being missed, why wait times are increasing during certain periods, and you can use these metrics to anticipate customer needs and increase satisfaction. You can which pages your visitors are chatting from and whether they are converting to paying customers using Zendesk Chat's integration with Google Analytics. Note: This tutorial assumes that you are already using Google Analytics and are familiar with the basics of how it works. If you’re new, Google Analytics is a powerful tool that helps you understand and analyze your web traffic. You can easily find good tutorials online explaining how GA works. Before you can track your chat conversions on Google Analytics, you’ll need to set up Zendesk Chat and Google Analytics. We’ve provided a complete guide on how to do that here: Using Google Analytics with Zendesk Chat. In this guide, we’ll focus on using the Zendesk Chat/Google Analytics integration to track conversions from chat. Assuming you’re already tracking chat statistics, the first thing you’ll need to do on Google Analytics is create a goal. The goal you create depends on the metric you want to track. For example, if you sell shoes on your website, your goal might be to track how many of each pair of shoes you sell. Select the Place an order template. Next, enter a description for your goal and select a goal type, which determines the action you're measuring. In this example, we want to track when shoes get sold, so the Destination type should work. Note: Learn more about other goal types and what they track in Google’s support forum. Finally, enter the goal's destination. In this case, you would select something like /thank-you.html, or whatever the URL is of the page that appears after someone has made a purchase. And that’s it! Now you can track how many of your website visitors are meeting the goal from anywhere in Google Analytics. For example, you might find that 100 people visit your website and 10 of them make it to the /thank-you.html page. This indicates that your website has a 10% conversion rate, or 10 people have made a purchase. Once you're set up to track your overall goals in Google Analytics, you can then refine to segment out only the chat traffic. To do this, we'll create a segment using the Served by Operator event, which measures each time a visitor chats with an agent. 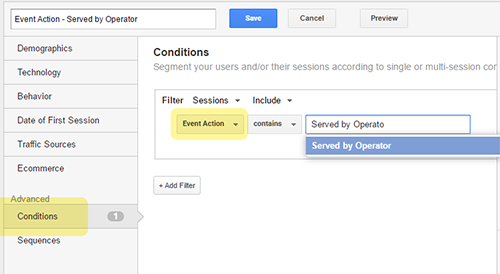 Go to any view in Google Analytics and click on +Add Segment. Select Conditions and filter by Event Action. Set the event action to Served by Operator. Name your segment and click Save. That’s it! Your segment is now ready and you can use it to compare the conversion rate of your website before and after chat. You should now have two sections below, one showing you the percentage of visitors that completed your goal and another showing the percentage of visitors who had a chat (Served by Operator) and then reached the goal. Once you’ve got everything set up and the stats start rolling in, come back and tell us what you've learned about your chat conversion rate in a comment below! Thanks for sharing these practices. Is it possible to define a goal for any zopimchat interaction? Let's say I want to count number of chats as goals on my Analytics accounts so that I can evaluate my Ads performance with zopim interactions. We only aggregate total chat data, but you can see that against your Ads performance. We've recently put this in place to look at our chat conversion rate. -Does this only pick up conversions that have occurred during the chat? -Is there any way to track those that convert after a chat? (Eg. they chatted and then come back and convert the next day). Great to hear you're able to use it. To answer your question - the method described above only picks up conversions where the chat has been served by an agent. If you like you can remove that filter to see all conversions. Google Analytics should track conversions even if the customer leaves the page. This is because GA leaves a cookie on the customers browser and tracks them when they come back. I'm trying to track the visitor paths that my clients use to enter my chat. You should be able to do this using the Visitor Path when you chat with an individual customer. However, as you point out this can be a little tedious. Using Google Analytics you could look at the referral path? Is that something you've tried before? Don't hesitate to reach out if you have more questions. I have a client who has Zendesk on their website, and outside the live chat window, we want to track inquiry submissions (contact us form) but only when the user self-identifies as a specific type of user in our drop down menu within the zendesk widget. How are the self-identify if it's outside the chat window? I understand that they choose a department (using the drop-down menu), but how does this impact the submissions form? Sorry when I said live chat window, I didn't mean the widget, I meant the window of time that chat was live. In our case it's 7am - 3:30 pm PST. The functionality of the chat box outside the hours stated above is that a user has the option to click a "Contact Us" button. When clicked it produces a short form and of those fields one of them is the self-identifier form field we'd like to be the "conditional trigger" so that when someone selects the desired drop down and then clicks Submit on the contact us form, it's considered a conversion. However if that particular self-identifier wasn't selected, we don't assign a conversion. An example might be we have colors as departments in our self-identifier form field. We only want the conversions to be triggered if a user selects "Red" vs "Blue" or "Green". So if 5 users clicked submit, but only 1 of those selected "Red" it would attribute 1 conversion, versus 5. Would you mind dropping us an email on chat@zendsk.com so we can discuss your use case further?